Panna II Garden has been quietly serving mediocre food in the East Village for 35 years, but only recently have crowds slammed the place to the point where you’ll wait 90 minutes for a table on a Saturday night -- even with a reservation. So why are tourists and New Yorkers beating down the door to get into a spot with middling food and coarse service? Because its luminous, rainbow-hued interior looks incredible on Instagram. The decor doesn’t just make up for the food; it justifies its existence. Opened in 1983, Panna II Garden might be NYC’s most successful millennial. It’s one of four Indian restaurants perched two-by-two on First Avenue between East Fifth and East Sixth Street -- the last vestiges of downtown Manhattan’s “Curry Row.” Panna II’s BYOB policy, relatively cheap menu, and tangle of chili pepper lights have been delighting birthday girls, big groups, and under-21 NYU students for decades. And now its long lines are grieving the very people who do it for the ‘gram, not the garam. Instagram exploded with #pannaii pictures of influencers and wannabe-influencers lit red and gold and green. Over the years, waiters would stand outside each restaurant at dinnertime, shouting about the superiority of their food, their service, their prices, their lights. If you paused to consider eating there, you risked being physically grabbed off the street and marched to an empty table. 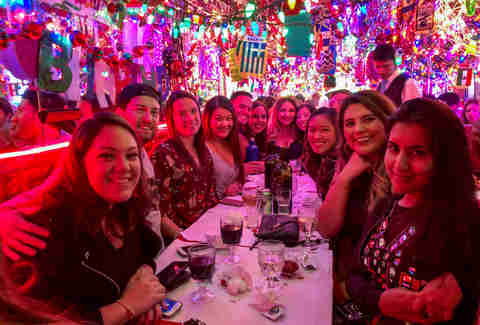 The competition and year-round Christmas cheer turned Panna II and the other three restaurants -- Milon, Spice Wala, and Royal Bangladesh -- into East Village institutions. Then, in December of 2017, High School Musical star Vanessa Hudgens posted four Instagrams posing under Panna II’s chili peppers for her 30.4 million followers. (“What a trip,” one of her captions read.) Soon, Instagram exploded with #pannaii pictures of influencers and wannabe-influencers lit red and gold and green. The hashtag, which now has more than 2,000 posts, is an endless scroll of colorful lights with hardly a samosa in sight. Panna II was poised to join the ranks of over-hyped, over-Instagrammed restaurants. By the time Emily Ratajkowski celebrated her 27th birthday there in a sheer bodysuit in June of 2018, it required the patience of a saint to get a table. At 9:30pm on a recent November Saturday, it’s a biting 35 degrees and the staircase up to Panna II is more packed than an L train platform. The waiting crowd is shoulder to shoulder, making it nearly impossible to move up or down the stairs. The Sprite-sipping doorman, dressed in a sports coat and scarf, shouts down to the street every five minutes to reassure those with reservations that they’ll be seated in five minutes. At street level, the line splits in two directions; a young drunk girl sways dangerously, evading her date’s grasp, and then falls backwards into the bike lane. Her date looks up at the line, defeated, then leads her reluctantly away to find some pizza. Panna II’s late in life, juggernaut success makes it vulnerable to the internet’s seemingly unending supply of armchair reviewers. A search of its 902 Yelp reviews offers 66 results for “terrible,” 37 results for “horrible,” 110 results for “bad,” 76 for “worst,” and, blessedly, only one result for “diarrhea.” (Milon, Royal Bangladesh, and Spice Wala have 487, 192, and 27 total reviews, respectively). If you crack open the odometer and dial it back to 2005, five years before Instagram and its influencers would make even simple things like sipping a mug of cocoa, staring into the middle distance, and having dinner aspirational, Panna II’s first Yelp review is a little more forgiving, tapping into the spirit of the place. Once plucked from the line and hustled inside, it becomes apparent why Panna II is so photogenic. 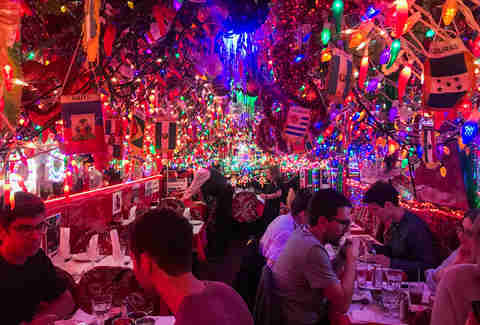 Flags of the world are twisted into lit-up plastic chili peppers and lanterns and fairy lights still in their styrofoam packaging hang heavy -- nearly neck-height -- so low you need to duck your head on the way to your table. It feels like being inside of a jewel box, or tripping on Robitussin. The restaurant itself is the size of a subway car and nearly as claustrophobic. Diners eat elbow to elbow, negotiating space between the chairs. No one gets a napkin, although you do get complimentary papadom, crisp and laced with whole cumin. A club remix of “Ring the Alarm” is pumping. 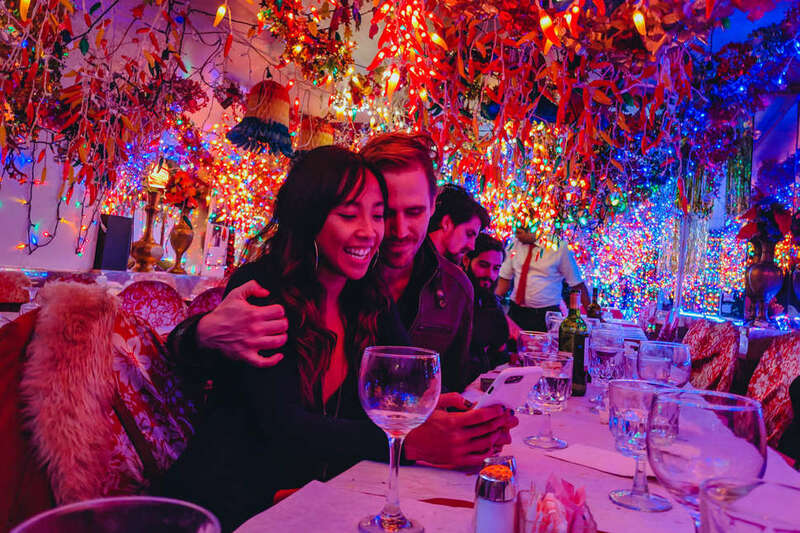 Occasionally, the waiters turn off the overhead lights, leaving diners to eat by the colorful glow -- all the better to snap a ‘gram. Panna II’s BYOB policy leads to interesting food-and-booze pairings. A party of four drinks Smirnoff Ice; a party of eighteen cheers with splits of pink prosecco; and a group of three young women by the door have made their way through two-thirds of a handle of Tito’s vodka. When a waiter arrives with a fresh mixer, he pecks one of the Tito’s girls right on the mouth. She looks briefly surprised, then turns back to her phone. Although the food appears to be beside the point, one still must place an order. Onion naan, though browned, is raw inside; a finger pressed into the dough leaves deep impressions. Water is not forthcoming. A reporter is called “sweetie,” although she avoids being kissed on the mouth. In the fresh night air again, just after 11, the temperature has dropped and the line is down to 15 people. “Is it good?” someone on line shouts at a woman leaving the restaurant.